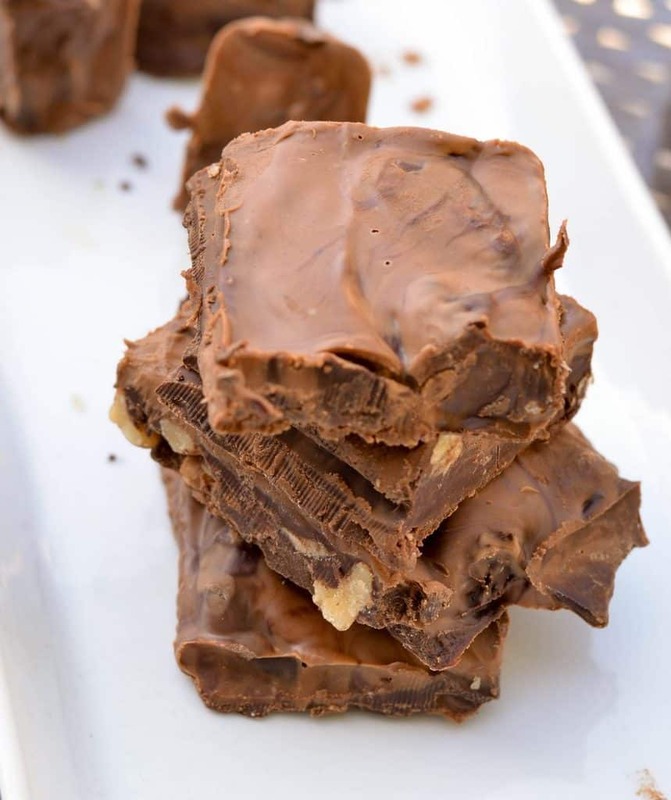 No-Bake Peanut Butter Chocolate Bark Recipe: Make it Together! Did I say no-bake, chocolate, and peanut butter? Yep, you heard right! I bet you’re drooling right now over this mouthwatering, easy snack, and with reason. The combination of peanut butter and chocolate in a snack that takes minutes to make? Yum! It’s not just any peanut butter, either. 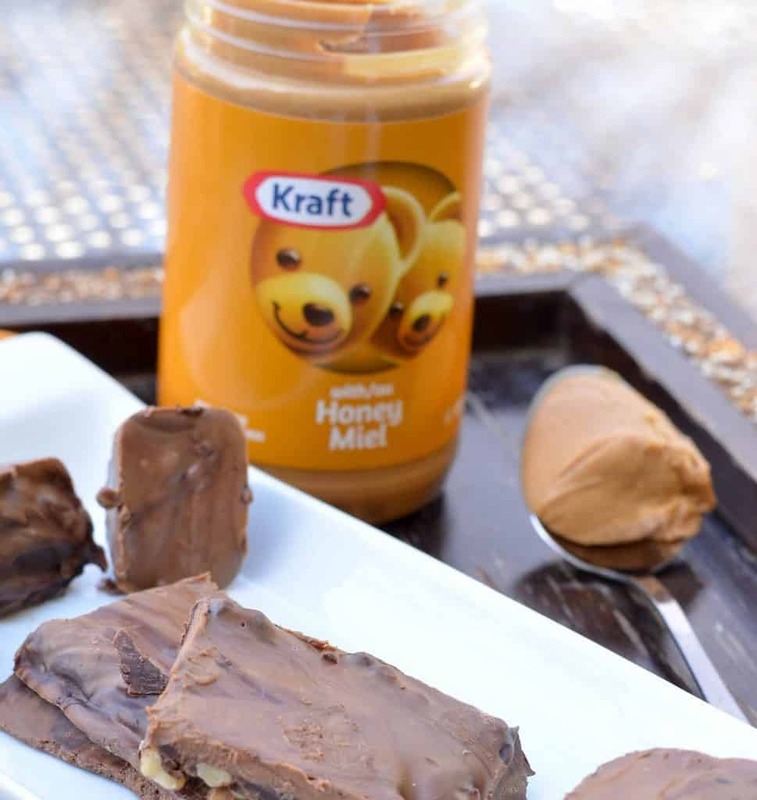 The smooth deliciousness of the Kraft Peanut Butter with Honey combined with chocolate is heavenly. Who can resist this treat? Not me, nor my kids! I had to make it 4 times before being able to take any pictures. The kids were rushing to eat it. I had to hide the last batch. Otherwise, I would not have been able to share this yumminess with you. Of course, the kids helped in the making (and licking the melted Kraft Peanut Butter with Honey and chocolate). Baking (or no-baking, in this case) is a great family activity. It creates magical moments and strengthens family bonds. It can be messier with the kids around but I always make sure they help in the cleanup process. Let’s get to the kitchen and see how easy it is to make this No-Bake Peanut Butter Chocolate Bark recipe. 1/4 cup of walnuts, chopped. Line a large tray or plate with parchment paper. You can use a baking mat. Place the chocolate in microwave-safe bowl. 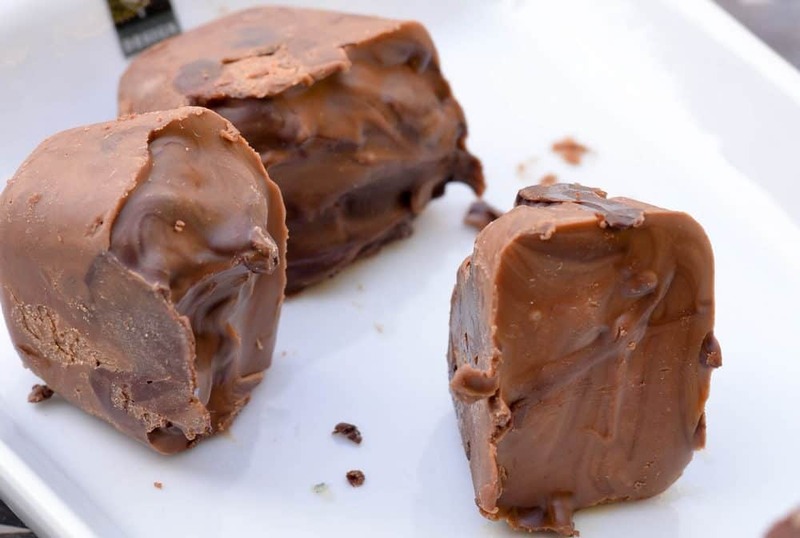 Melt the chocolate in the microwave: making sure to stir every 20 seconds to avoid clumps. You can also use the double boiler method (it was my mom’s favorite one). Melt in the microwave. Stir. Pour the mixture on the tray. This can be a little messy. I used a spatula to make the edges and the top even. You want your mixture to be about 1-inch high. Here’s a little trick I used to keep it even, avoid overflow and know where to stop: take some folded-up parchment paper (folded to an inch in height) and create a little wall around the edges of the tray. You can also pour the mixture into ice cube trays. I did both: half of the mixture on a tray and half into ice cube trays. It yields around 4 cubes and 4 to 5 thick chocolate barks. Doesn’t it look delicious? It’s so much fun to make, too! 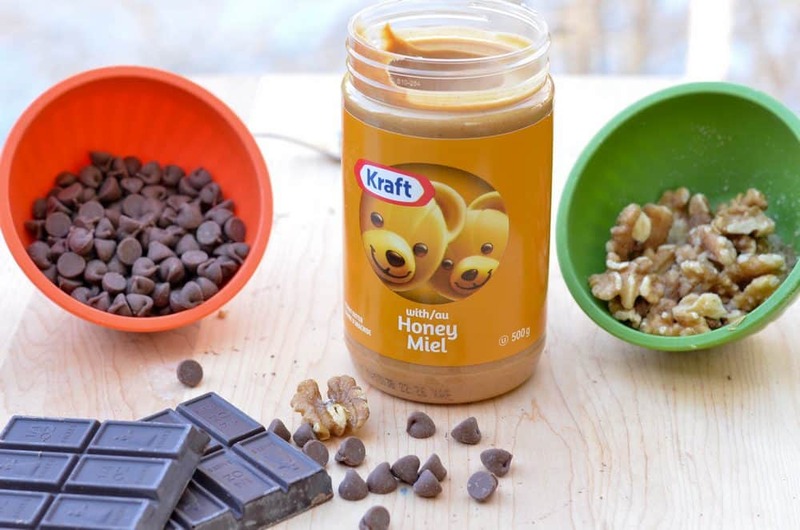 So by now, you should realize that Kraft Peanut Butter is so much more than just a spread for sandwiches and toast. With one jar of Kraft Peanut Butter with Honey, you can have endless possibilities. Use it in your dessert recipes, snack ones, dinner and much more. It is the perfect ingredient to enhance your recipes. Trust me! The idea is to think outside the box and add a touch of Kraft Peanut Butter in your daily cooking. That’s what I did with this no-bake bark. The recipe was my grandmother’s. She used to make these chocolate bars as an after school snack. I have fond memories associated with this recipe. I used to hide in my room and eat a bunch by myself. Heaven! I just upgraded it with Kraft Peanut Butter with Honey, and now my kids will have those same fond memories. Isn’t that an awesome way to bring generations together? Want to upgrade your recipes with Kraft Peanut Butter? Visit www.sticktogether.ca for more delicious and easy recipes. Stay tuned for the next recipe using Kraft Peanut Butter. I will be sharing another yummy one as well as a chance to win a Kraft Peanut Butter grand prize! While you’re waiting for my next delicious Kraft Peanut Butter recipe, tell me about your favorite way to use peanut butter to bring a favorite recipe to life. Although this post has been generously sponsored by Kraft Heinz Canada ULC , the opinions and language are my own. to try this as it sounds so delicious.Thank so much for the post!! OMG that looks so delicious! Boy, does this look yummy! I haven’t seen this Kraft peanut butter yet near me but I can’t wait to try it. Yummmm!!! I am a chocoholic so I’m definitely not going to say no to that. Thanks for the recipe. Can’t wait to try it. This looks absolutely amazing! I would love to make this and take it with us as we work on our new fixer upper! That looks like it is right up my alley. I love how chocoately it looks and how each bit has that peanut butter flare to it. YUM! Oh man, peanut butter and chocolate is my weakness. I must save these and make REAL SOON! Chocolate + Peanut Butter – Baking = All The Yes’s! Sounds really tasty and simple to boot. Perfect combo all around. I don’t normally cook with peanut butter. We just enjoy it in sandwich or on items. But I need try new recipes like this. Yummy, I bet this is so good. I haven’t had fudge in a very long time. My mom and grandma made it every Christmas. That looks fudgy and delicious! I love chocolate and peanut butter together. This looks so good. I want to have some right now! This sounds like amazing!! 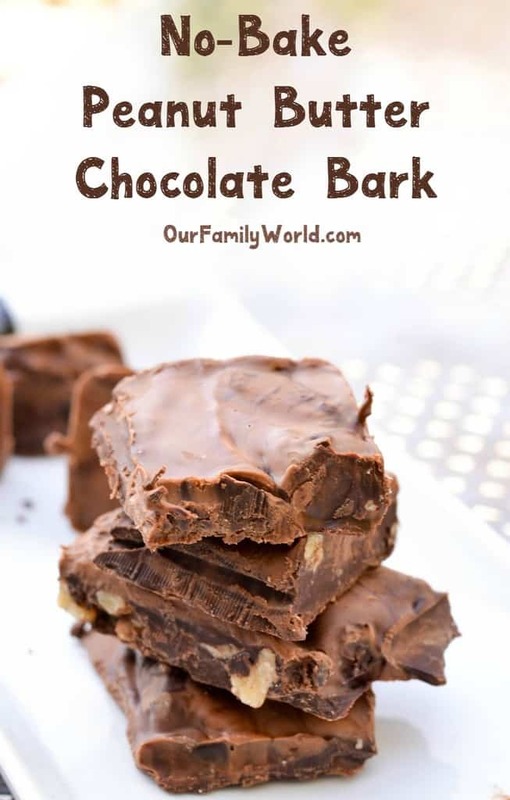 My family loves peanut butter and chocolate I never thought to make bark with it like this before! This looks super yummy! I will have to try to make it, it looks smoother than other recipes I have seen and made for bark! This looks and sounds so amazing! I love anything with peanut butter and chocolate. I can’t wait to try this recipe. That looks really delicious and I am not a huge peanut butter fan. I didn’t know that Kraft makes a honey flavored peanut butter and will be checking it for it the next time I go to the grocery. That looks so good. I would definitely make it with the kids! They would love that! Candy barks are a family favorite at our house. Your peanut butter chocolate bark looks heavenly so I plan on trying your recipe out on my own kids. I love making different barks. This looks so yummy and easy to make. It might be a new favorite. This looks so delicious and easy to make. I will have to try this recipe this weekend with the kids. Chocolate and peanut butter are my favorite sweet combo. I know what i will be making this weekend. Looks very sweet and yummy. My family would love me if I made this for them. 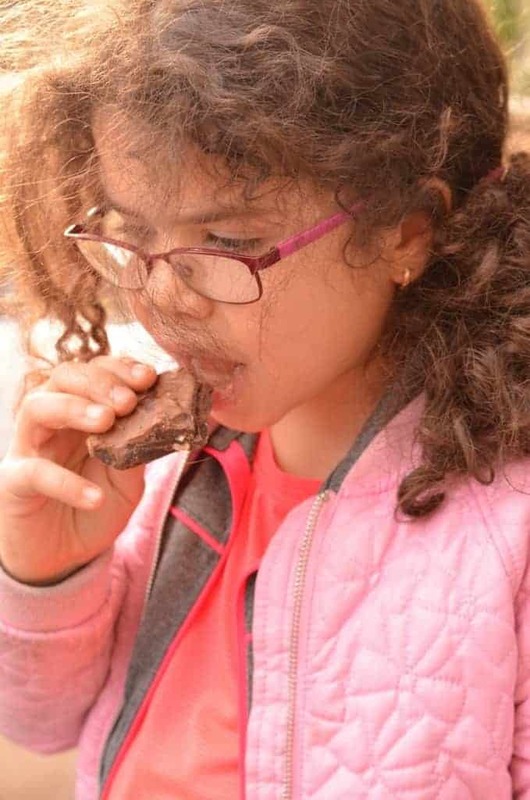 No bake recipes are a great idea because they mean children can mix and make a complete snack on their own. You simply can’t go wrong with peanut butter AND chocolate. It’s a totally perfect combo! Your recipe sounds like a perfect snack. 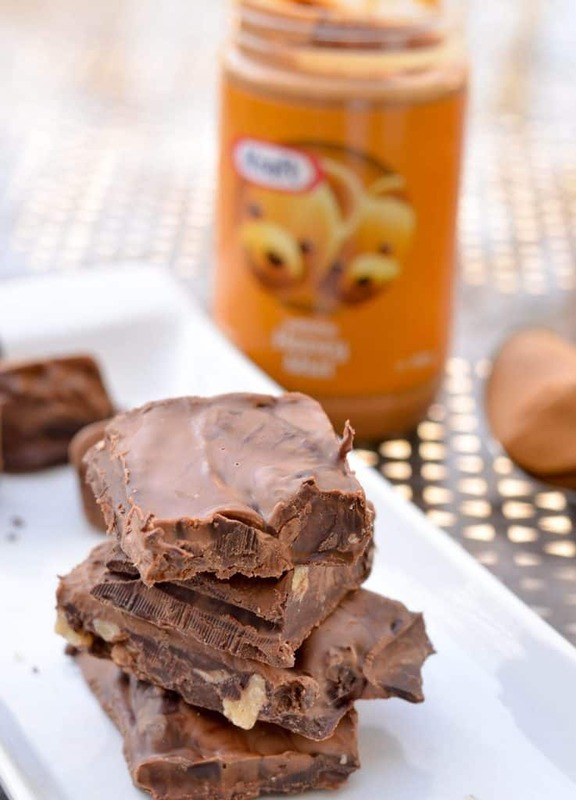 I love to make peanut butter fudge with Kraft Peanut Butter. It’s always gone pretty quickly too! This bark looks absolutely wonderful! What I love about it is that it goes beyond a traditional bark of melted chocolate and a few add-ons. This looks like an actual chocolate bar that would sell on store shelves! This would be a great snack to take with us when we hike. The little bit of sweet goes a long way when trying to keep your energy up. My husband loves that peanut butter with the honey – he usually just eats it with graham crackers at night. Oh my heck those look good!! I’m adding up the ingredients in my head to see if I can whip up a batch right NOW! Delish!! This looks amazing! I know my girls would just love this. I love the combo of peanut butter and chocolate, so I bet I’d love these. Peanut butter and chocolate are two of my favorite things! But I LOVE the peanut butter and honey option! Makes it even BETTER! I’m seriously salivating over here! No bake? Yes please! I’m making these with my kids asap! Maybe I could get my son to eat peanut butter if I made these. He will eat peanuts, but not peanut butter. I don’t know if I would eat them all though. Peanut butter and chocolate bark. Which I DON”T have to bake? I think yes! That looks dangerously delicious. I could probably eat all of these in one sitting. They look just delicious. I cannot wait to try them. Now that sounds like one delicious snack! I wonder if it will work with cashew butter since my daughter is allergic to peanuts. Get a free Father’s Day Photo Book from York!